You receive discounts up to 10%, if your stay is within the travel period of 05.05.2019 to 24.05.2019. You receive discounts up to 20%, if your stay is within the travel period of 18.05.2019 to 22.06.2019. You receive discounts up to 10%, if your stay is within the travel period of 04.05.2019 to 17.05.2019. You receive discounts up to 15%, if your stay is within the travel period of 26.04.2019 to 17.05.2019. You receive discounts up to 15%, if your stay is within the travel period of 28.04.2019 to 17.05.2019. Porta Holiday - your holiday rental in Pollensa! Do you want to rent a property in Pollensa for your holiday or do you have a question regarding our holiday home portfolio in Mallorca? You could not find your dream -finca in Pollensa yet? Call us at +44 2037 695 431 or send an email. Our Porta Holiday holiday rental in Pollensa will be happy to provide consulting and will find your dream property for you. Pollença has a wonderful old-town and is rated as one of the most beautiful villages on the island. The entire municipality, which has the same name, is very appealing - the sea, the beaches and the mountains are relatively close together and offer correspondingly beautiful panoramas and an enchanting environment both to live and have holidays. The foothills of the Tramuntana in the northwest of the island and a large part of the mountain chain are just as much part of the municipality as is the charming port of Pollença and the small bay of Cala Sant Vicenç. The pearl of the area is, however, the village of Pollença itself. The inhabitants of what is today called Alcudia, which was much closer to the sea, founded the village in the 18th century a little further inland to the west in the green hills of the surrounding countryside in order to protect themselves from the then frequent pirate attacks which came from the sea. Interestingly, Alcúdia was once an ancient Roman settlement called Pollentia and when Germanic tribes destroyed this in the 5th century BC, the name still continued to characterize the area and later became the name of a new village. The towns main landmark is the Calvary mountain with the pilgrimage chapel of El Calvari up to which lead 365 steps – one for every day of the year. The climbing of these steps is rewarded with a unique view over the light brown roofs of the houses as far as the bay of Alcúdia and the mountain peaks of the Tramuntana. The true centre of the town is the exceptionally charming market square, surrounded by cafes and restaurants. The church of Nostra Senyora del Angels, dating from the 13th century, stands on the edge of this busy square and a little further on is the Dominican monastery of Sant Domènec. A real curiosity can be found in the towns history museum, housed in the monastery - a wonderful Mandala from the Himalayas which the Dalai Lama once brought personally to Pollença to present to the town. The old monastery building hosts cultural events and classical concerts all year round, the best known of which is the Festival de Pollença which is always held in the monastery cloister in the open air during the months of July and August, and regularly hosts international ensembles and soloists from all over the world including the French National Orchestra, Lord Yehudi Menuhin, Monserrat Caballé, Goran Bregovic etc. Culture, especially music and painting, is very well cultivated in Pollença so it has numerous small galleries, the most famous being probably the Galeria Maior in the village square. And witness to its great handicraft tradition and to the good taste of the town are the many small boutiques and delightful little shops waiting to be discovered. On the Plaça de l'Amoina is an imposing sculpture of a rooster on the Fond de Gall, dating back to 1827, and a rooster also decorates the coat of arms of Pollença. The square looks quite unspectacular at first sight, but is of great importance to the inhabitants as the battle against the pirates who attacked Pollença in 1550 was won here. This battle is, incidentally, reproduced every year on August 2nd with a huge spectacle including fireworks which really should not be missed. So too the Easter procession, which is considered one of the most beautiful on the island. Outside the village are other places of interest to be found, such as an ancient Roman bridge or the 14th century hermitage Puig de Maria, as well as the nearby prehistoric caves of l'Alzineret. Pollença itself is a perfect starting point for walks and the whole area is a paradise for hikers. The "Ornithological Trail" for example, starting from the port is an enchanting path leading up to the little bay of Cala Boquér, where many wild birds can be observed. And for golfers the 9-hole golf course Golf de Pollença is located in the nearby hilly area. In the hills of Pollença German rock star Peter Maffay has a Mallorcan holiday facility for socially vulnerable and traumatized children, the FundaciónTabaluga. Each year around 400 children with their carers can take part in active holidays at his finca Can Sureda. His farm shop and bakery is open to the public who can buy organically-grown fruit and vegetables from his finca and cheese from his goats, as well as homemade jams and honey, and the different kinds of bread (there are even German pretzels!) enjoy an excellent reputation. The Maffay fruit and vegetables are also sold on Sundays at the popular weekly market which meanders through the winding streets of the town. The rock star himself can sometimes be seen on the square in the early hours of the morning with a coffee, usually at the Club Pollensa or the Can Moixet. In the rooms of his foundation in the Carrer Metge Sureda no. 14, local artists can exhibit their work. The famous Spanish artist Joan Bennassar was also born in Pollença and has an impressive studio near to the village. His favorite motifs are fat-bellied, voluptuous women, but also vines belong to his favourite themes as Pollenca produces very good wines, a fact which the ancient Romans greatly appreciated. The Bodegas ca'n Vidalet, for example, uses the combination of the sea breeze, the Mediterranean warmth and particularly the chalky soil to produce its excellent wine, and a visit to the German winemaker Christina Shallock in Bodegas Xaloc with her lovingly cultivated and award-winning organic wine should not be missed by any wine-lover. 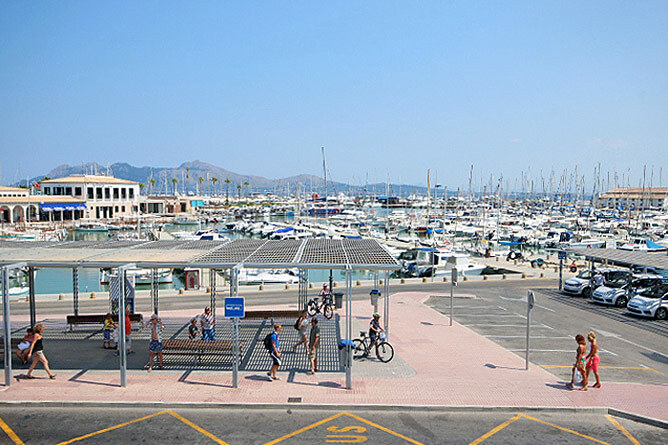 Visitors to the town should definitely visit Pollencas lovely port, the Port de Pollenca, which is particularly popular amongst the English. The pretty promenade is lined with pines and tamarinds and here there are no giant hotels, only beautiful, venerable summer villas and small, cosy cafes, and the sheltered bay is not only perfect for bathing but also to learn to sail. you are reading: Pollensa: holiday properties for rent in Pollensa Mallorca · Porta Holiday Rating 4.7/5 by 123 testimonials.